Real life on the Twin Cities jazz scene is plenty! This weekend, hot club chanteuse Connie Evingson stretches out with the Hot Club of Detroit in a special one-night gig at the Dakota (9/11), while across the river at the Artists Quarter, Lucia Newell and her Quartet (Laura Caviani, Gordy Johnson and Kenny Horst) swing through three distinctly different sets of bossa, bebop and beyond, also for one night only (9/11). Here’s my plan: Connie and the Hot Club, at least the first set at the Dakota at 8 pm. Hop in the car between sets and head east to St. Paul, catch the last two sets of Lucia Newell. Or something like that. If I had my own helicopter I would hve an easy time returning to the Dakota for the last of Late Night, which tonight features the debut performance of the Zacc Harris Quartet. Guitarist Zacc takes on Kelly Rossum’s rhythm section of Bryan Nichols and the Bates Brothers. All this in one night? There’s more to Friday night—Debbie Duncan holds forth at Crave (come late, you might actually find a seat near the music and be able to hear her! ); Maud Hixson and Rick Carlson (as per usual) at the Downtowner Woodfire Grill in St. Paul. And it is the first day of the Concrete and Grass Music Festival in downtown St. Paul (Mears Park), a celebration of all things music including some things jazz, with jazzers Story City at 3:30 pm and accordion wizard Dan Newton at 6 pm. Come back Saturday (9/12) with the McNally Smith Student Ensemble on stage at noon; Moore by Four at 4 pm; Alicia Renee at 5 pm; Sunday (9/13) brings gospel jazz with Ginger Commodore and Tanner Taylor at noon and the edgy sounds of Jello Slave at 5pm. Another outdoor festival brings smooth jazz to the neighborhood—at Selby and Milton in St. Paul, it’s the annual Selby Ave JazzFest, with this year’s headliner, Kim Waters. 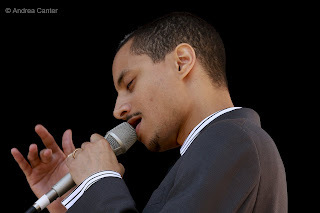 Saturday night brings a very special and rare performance to south Minneapolis, when hometown-boy-makes-good José James and his quartet (featuring fellow South High grad Chris Smith on bass and another local star, Brandon Commodore, on drums) brighten the late night series at the Pillsbury House Theater (food at 8, music and other performances at 9 pm). I just heard José and Chris at the Detroit Jazz Festival. It’s easy to understand the great press José is earning as he builds his reputation at top clubs and festivals, and as guest with such luminaries as Chico Hamilton. No slouch himself, Chris Smith continues touring with the great Jeff “Tain” Watts while finishing studies at the New School in Manhattan. Another later gig on Saturday finds the inventive young pianist Dan Musselman at Café Maude with compatible cohorts Matt Peterson and Jay Epstein. The modern edge of jazz will also be on display at the Artists Quarter with How Birds Work and Late Night at the Dakota with “Quartet” featuring Chris Thomson, Bryan Nichols, James Buckley and Sean Cary. If mainstream is more your style, check out Lee Engele singing her heart out at the new Crave in Mall of America. Want some education with your piano jazz? Saturday night brings pianist/educator Mary Louise Knutson to the St. Barnabus Center for the Arts in Plymouth, where she will present an evening to help you in “Making Sense of Jazz,” combining lecture and audience participation with live performance. Monday (9/14) brings the next benefit for ailing guitarist Dean Magraw, this one at the Dakota with vocalists Cookie Coleman and Cynthia Johnson and visiting former resident pianist Adi Yeshaya. Avant garde reigns on Mondays at Homewood Studios in North Minneapolis where this week (9/14) Milo Fine improvises on a theme of autumn leaves, and Tuesday (9/15) at the Kitty Kat Club in Dinkytown with the always inventive Chris Thomson. On the other side of the jazz coin, swinging vocals waft from the teeny “stage” of Fireside Pizza in Richfield, courtesy of Charmin Michelle and Denny Malmberg on Monday, with Maxine Souse' sitting in on Wednesday (9/16). The big one that will get away from me this week is the exceptional Eldar, returning to the Dakota with his trio on Wednesday (9/16), unfortunately for me the first day of my California trip. Eldar Djangirov emigrated from eastern Europe about ten years ago and has been catching the ear of the jazz cognescenti ever since—from Billy Taylor to Benny Carter to Marian McPartland—he was her youngest ever (at the time) guest on Piano Jazz. 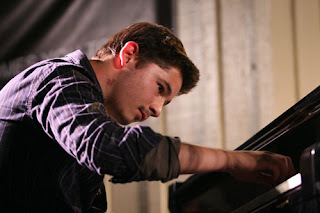 Compared variously to Art Tatum, Oscar Peterson, Bill Evans and Herbie Hancock, Eldar just released his third for Sony, Virtue, a dazzling display of performance and composition chops by a 22-year-old maturing into one of the top talents of 21st century jazz piano. I’ll also miss the Atlantis Quartet at the Dakota and the Lomheim/ Johnson/Hey trio at the Artists Quarter on Thursday night (9/17). I’ll enjoy northern California but hate to miss either of these great bands. Coming soon: Again, I will miss some big gigs next weekend, especially Buffalo Collision with Tim Berne, Ethan Iverson, Dave King and Hank Roberts on both Friday and Saturday (9/18-19) on the late shift at the Dakota and a rare weekend with the Tuesday Night Band and guest Pete Whitman at the Artists Quarter, prime time September 18-19. Sisters in Song (Lila Ammons, Vicky Mountain and Dorothy Doring) reprise recent performances of the songs of Ella, Sarah and Carmen at Antonello Hall at MacPhail on Friday (9/18); and Sunday (9/20) brings visiting native vocalist Sony Holland to the Dakota. Also Sunday night, songbird Connie Evingson launches her Jazz at the Jungle series (at the Jungle Theater) with a night of Peggy Lee tunes. The Marcus Roberts Trio will be at the Dakota, September 22-23.